You’ll read how there’s an enzyme gap and that the benefits to aide your digestive system is prevalent! Everyday Enzymes™ helps break down food so your body can absorb the proper vitamins and minerals better. Nails and hair grow much better and they’re GREAT for anyone who eats Keto. You’ll notice within two weeks of starting these that chronic, dry and cracked skin should change. Eliminate abdominal pain, bloating, gas, and acid reflux. Get the most nutrition out of the food you are already eating. Get off of pharmaceutical or over-the-counter drugs. We live in a quick-fix, medicine-hungry nation….but medicine is not always the answer! Our body can heal itself if given the chance and this drug-free, all-natural supplement will allow you to do that. Many people suffer from minor (or major) stomach issues (like gas, bloating, acid reflux) and while taking an antacid may provide relief…it is merely helping the symptoms, not the problem. 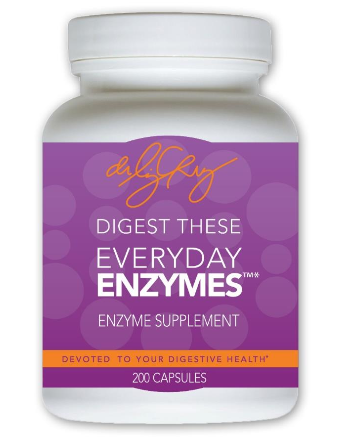 Everyday Enzymes get to the root of the problem and have been proven to be extremely effective in getting people off pharmaceutical or over-the-counter drugs for digestive issues. A healthy stomach often benefits many other areas of health. Even if you don’t have stomach problems, these supplements can help boost your immune system, fight fatigue, and even help with anxiety. In order for your body to benefit from what you eat, you need digestive enzymes to break down the food. Proteins need to be broken down into amino acids; fats need to be broken down into fatty acids and cholesterol; and carbohydrates need to be broken down into simple sugars. At birth we are given a certain potential for manufacturing enzymes in our body, creating an enzyme “reserve.” However, if we do not continually replenish that reserve through proper nutrition, it runs out. Enzyme deficiency can cause digestive issues, a weakened immune system, fatigue, acne, eczema, headaches, mood swings, joint pain. Having a lack of digestive enzymes puts tremendous stress on the body, because it is then forced to draw reserves from other locations throughout the body. The more we depend on our body to create digestive enzymes without the proper tools, the less time and energy the body’s systems and organs have for rebuilding and replacing worn out damaged cells and tissue. This puts a tremendous amount of stress on the endocrine system, as well as the immune system. After years and years of relying on our “reserve,” it is eventually depleted. 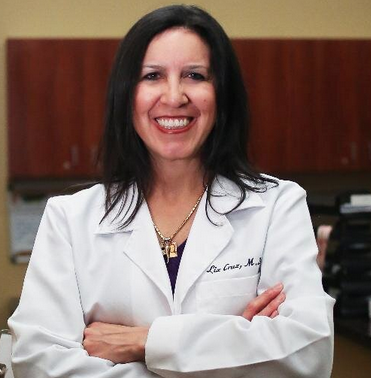 Dr. Cruz is on a mission to educate and help families adapt a healthy lifestyle that fits their needs. //www.drlizcruz.comDr. Liz Cruz is a gastroenterologist, an author, and (most importantly) a parent of 4 children. She is the creator of Everyday Enzymes, as well as a variety of other wellness products designed to promote all-natural, holistic wellness. Cruz’s products have received critical acclaim and are widely praised for effectively reducing the need for prescription medicine. Cruz is a Diplomat of the American Board of Internal Medicine and the American Board of Gastroenterology. She is a member of the American Gastroenterological Association and the American Society for Gastrointestinal Endoscopy.